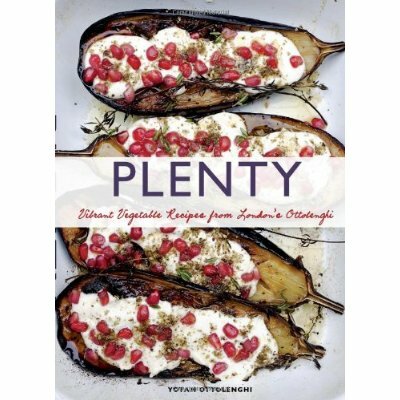 Plenty: Vibrant Vegetables from London’s Ottolenghi: This is one of my current favourites. Ottolenghi is not a vegetarian but is super veg-friendly because he grew up in the Middle East and his mother’s cooking was built on a strong foundation of beans, nuts, grains, and vegetables. This cookbook grew out of his hugely popular vegetarian column in a local mag. I like the cookbook so much that I now give it to anyone and everyone who has a birthday. Everyone should have it in their collection. Vegetarian Cooking for Everyone by Deborah Madison: A little overwhelming because it’s so big but there is good stuff in there. Lots of vegan fare and vegetarian recipes that can be converted. super natural every day by Heidi Swanson: I love Heidi Swanson’s blog, 101 Cookbooks. It was one of my sources of inspiration when I was getting started on this no-meat / no-dairy path. I was excited about her cookbook coming out for that reason. It’s great, although I would say it didn’t totally meet my expectations. She does a lot of dairy! Now, that’s totally fine since she doesn’t claim to be vegan. It’s just that I didn’t find as many easily-convertible recipes as I had hoped. That said, there are a few gems in there like the curry-miso delicata squash with tofu and kale. Moosewood Restaurant Cooking for Health: How can you not have a Moosewood Cookbook in your list of favourite cookbooks? This one’s particularly good – an updated version that just came out in 2009 that includes “more than 200 new vegetarian and vegan recipes for delicious and nutrient-rich dishes.” So you mean, like, the Tempeh Bourgignon for example? Yow-sah! Bring it on. Vij’s Elegant and Inspired Indian Cuisine by Vikram Vij + Meeru Dhalwala: Not at all vegan but I love the coconut curry vegetables (a standard in our house), the pilafs etc. Just steer clear of the ghee and use good quality oil instead! 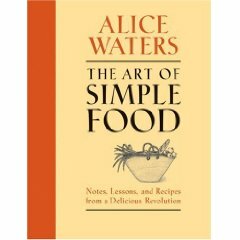 The Art of Simple Food by Alice Waters: Again not vegan or even vegetarian but Waters always has lots of good, solid, clean, yummy recipes based on simple vegetable ingredients. Chez Panisse Vegetables by Alice Waters: Ditto. Vegan Yum Yum by Lauren Ulm: My sister bought this for my mom. I haven’t explored it fully but there’s a good tofu lime recipe and others that look great. I’ll keep you posted. The Hip Chick’s Guide to Macrobiotics by Jessica Porter: My one criticism is I don’t love recipes that try to mimic meat and fish with lots of rice cheese and tofu chicken and fake bacon. Why? If you aren’t going to eat the stuff, don’t pretend to eat the stuff. This book falls prey to that tendency but, regardless, it still has some great recipes and a good description of the macrobiotic philosophy. 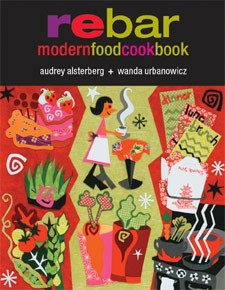 Rebar by Audrey Alsterberg + Wanda Urbanowicz: My friend Andrea gave me this cook book for my birthday (thanks Andrea!) and it’s great. Then my friend Cindy tipped me off on the vegan fudge brownies at the back. I made them on the weekend and they were fabulous. The kids weren’t 100% sold but maybe 85% which isn’t bad for vegan-suspicious teenagers. They have coffee in them which not everyone likes but I think it does wonders for you at about 3:30 PM when you hit that mid-afternoon crash. Refresh by Toronto’s own Ruth Tal: Great book. 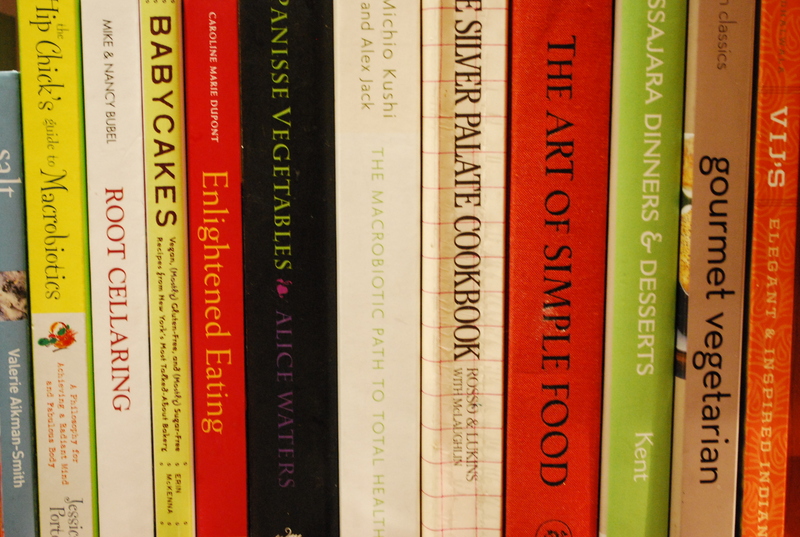 And if you’re vegan and from Toronto you owe it to Ruth to own it or one of her other recipe books. Or all of them. Support your local everything. The Green Goddess Rice Bowl is awesome. The Modern Ayurvedic Cookbook by Amrita Sondhi. These are healthful, healing recipes for life based on principles that were developed more than 5,000 years ago. The heart of the Ayurvedic philosophy is “our intimate connection to the elements in nature, and how they can help us to achieve a physical and spiritual balance in all aspects of our lives.” Sounds great to me! Who’s heard of GOOD? Okay, so it’s not a cookbook but it’s fabulous – a self proclaimed “collaboration of individuals, businesses, and nonprofits pushing the world forward.” Since 2006 they’ve been making a magazine, videos, and events “for people who give a damn.” It’s always full of interesting food-related stuff. Take this list of good books for new vegetarians. Love it. Or this awesome infographic on real good cheap easy food. So the infographic is not vegan, or even vegetarian, but it’s interesting and helpful and has onions, tomatoes, rice, and beans at its heart. And for that I thank the good people at GOOD. I have an old one I use a lot called “Quick Vegetarian Pleasures: More than 175 Fast, Delicious, and Healthy Meatless Recipes” by Jeanne Lemlin. And, friends swear by “How to Cook Everything Vegetarian: Simple Meatless Recipes for Great Food” by Mark Bittman. Neither are vegan exclusively but have lots of vegan options. Have to check these out. Thanks for the recommendations!